For his portrayal of Jack Donaghy, GE Vice President of East Coast Television and Microwave Oven Programming, in NBC sitcom 30 Rock (2006-2013), Alec Baldwin has won a (to use the technical term) smorgasbord of accolades, including two Primetime Emmys, three Golden Globes and seven Screen Actors Guild Awards. In our view, he would pretty much deserve this acclaim on the strength of his work in the episode ‘Jack-Tor’ (1.5) alone. 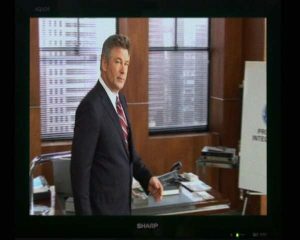 Within 30 Rock’s already highly (self-)reflexive framing, this episode sees Jack pressure showrunner Liz Lemon (Tina Fey) to include product placement on TGS with Tracy Jordan, the show-within-the-show, which Liz agrees to on the condition that Jack appears in the sketch in question. This leads to Liz and Pete Hornberger (Scott Adsit) watching a video of ‘outtakes’ of a previous corporate video shoot featuring Jack. 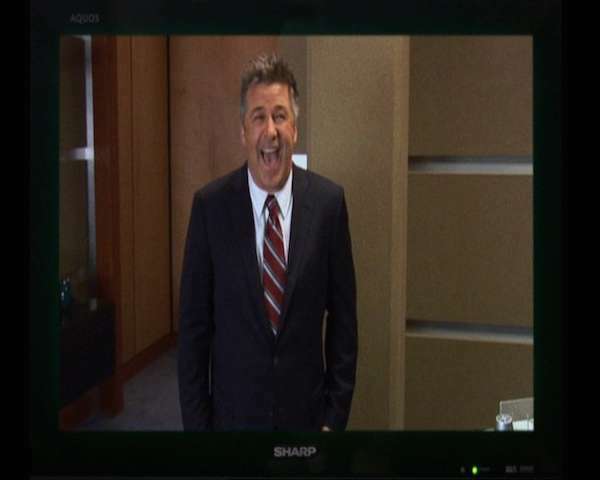 This ‘outtakes’ sequence can be found from 10.26-12.41 on the relevant DVD, and extracts can be enjoyed here and here. It clearly intertextually riffs on the infamous viral video ‘The Angriest Man Alive’ featuring then-motor-home salesman Jack Rebney; only Jack D. is less foul-mouthed than Jack R. – after all, as Liz Lemon points out in the network show’s pilot, ‘it’s not HBO, it’s TV’. For the purpose of our work, Baldwin’s Jack’s ‘outtakes’ sequence is fascinating because it delivers a rich meta-commentary on acting and what actors do. 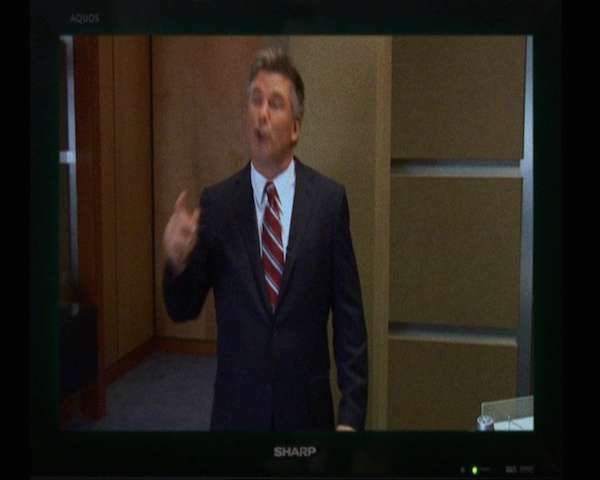 In particular, this sequence showcases good acting (by the actor, Alec Baldwin) that dramatises and articulates its opposite, bad acting (by the character, Jack Donaghy). Of course, ‘good acting’ and ‘bad acting’ are tricky, loaded and subjective terms, located within and informed by particular contexts, approaches and evaluative hierarchies. As Jean Benedetti rightly points out: ‘what is recognised as good or bad acting change[s] from period to period, as society and taste change.’ (2005: 3) These concerns explain to some extent that there is, we think is fair to say, not as much existing academic literature paying explicit and sustained attention to good and (especially) bad acting as one could reasonably expect to find. Even so, that good and bad acting are difficult and far from unproblematic does not mean that scholarship should shy away from engaging with such terms. Certainly, notions and judgements of what is good and bad acting feature significantly in industry and audience discourses, and if scholarship wants to meaningfully engage with acting, then this must include a reflexive consideration of achievement and failure, as well as the value judgments that always already (albeit often implicitly) inform academic research. Indeed, given that television studies as a discipline has recently been through a robust and sustained interrogation of notions of value and evaluation in the debates on ‘quality TV’, television scholarship perhaps stands to make a particularly enriching contribution to discussions of acting generally, and more specifically, to the burgeoning debates on acting on the small(er) screen. With Baldwin’s/Jack’s acting and our understanding of it placed within dominant Western conceptions of performance, strongly linked to psychological realism and Stanislavskian traditions, our interest lies with exploring what Baldwin here captures and has to suggest about bad acting, and how he manages to do so via good acting. 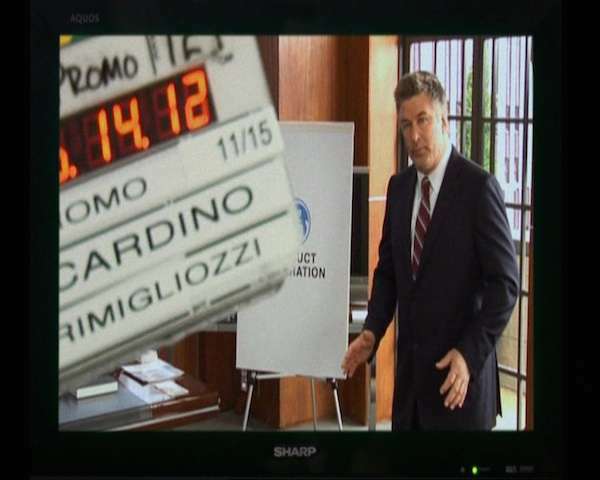 In this very fast cut sequence, which consists of roughly 38 (on-screen) shots, Jack struggles to remember his lines, calls for further takes, notices that a prop (a pen) does not actually work, corpses, calls for the lunch break, wonders what to do with his arms and comes up with ingenious solutions, questions the script, struggles with another prop (a display sign, which he labours to carry), stumbles over his lines, falls over, has his phone interrupt filming, gets distracted by a pigeon, and smashes part of the set. Given this comedy of errors, it is not surprising that the corporate video shoot took, the viewer learns, five days and 142 takes to complete. What even this brief summary hopefully conveys is that the sequence abounds with in-jokes about actors’ processes and egos (or clichés thereof): Baldwin’s Jack proves himself difficult to work with on the set, displaying a self-important (if not quite diva) attitude sometimes (and often unfairly) associated with actors, in the way in which he shows little regard for the needs of the shoot and crew. He is rude when barking at the production assistant: ‘I told you, ‘Don’t give me the line when I ask for the line!’’ He takes over the role of the director by calling lunch and for further takes, thus ignoring established production protocol, and questions the script: ‘…new synergy – does that sound odd to anyone else? Does that sound like news energy?’ (Here, Jack’s questioning of the script partly arises from his imprecise diction.) 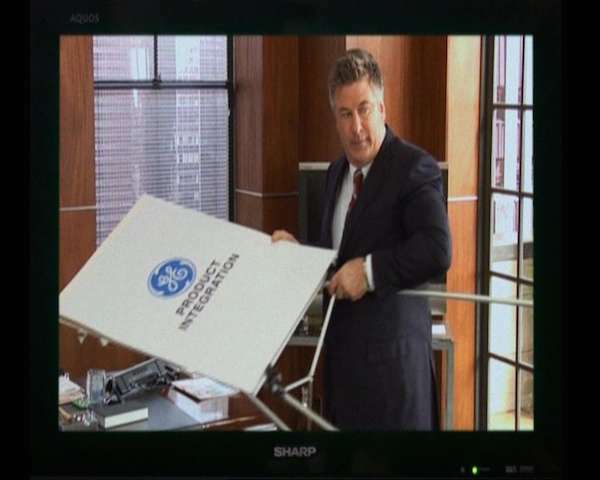 Of course, it is important to note that Jack can be so bossy and demanding because this is a promotional video for the company of which he is Vice-President; and the sequence is very much not reflective of actual on-set protocols and labour hierarchies as experienced by the majority of professional actors. Remarkably, not only is Jack quite rude, he is also noticeably insecure, looking to the crew for reassurance and approval of his acting work, especially with a twitchy smile in the final shot. Jack is furthermore distinctly unprofessional in that he is under-prepared for the shoot: having not learnt his lines properly, he is very far from being ‘off the book’ – which is usually a necessary precondition for a successful shoot, and definitely needed for a high-pressured commercial shoot. Instead, he prefers procrastinating, rudely testing the production assistant about whether she will give him the line, to actually getting on with the scene, finding a range of scapegoats (including a pigeon outside the window) to detract from his shortcomings. Just as he combines rudeness with neediness, so Jack also brings together unpreparedness with being somewhat ‘fussy’ and ‘precious’, drawing attention to the fact that the prop pen does not actually work. This sends up actor processes concerning inhabiting and immersing oneself into a fictional moment, often associated with method acting. The irony here is of course that the abysmal Jack displays the focus on the tiny detail of the prop pen – presumably this is something he has picked up on as a hallmark of good acting – and that this is delivered by Baldwin, who trained at the Lee Strasberg Theatre and Film Institute and is a member of the Actors Studio, thus very familiar with approaches to acting such as the method. With two such potent combinations – rude and needy, unprepared and fussy – Jack in the ‘outtakes’ does pretty much everything except actually act (or act well). Instead, bad acting abounds, and the specific aspects of unsuccessful performance that Baldwin’s acting here identifies are concerned with space, physicality, the mind-body connection, concentration, self-consciousness and failure to be ‘in the moment’, as well as a lack of a clear objective, integration and truthfulness. Very unlike Adam Driver’s meaningful engagement with the texture of space, Jack is (literally) painfully unaware of the space surrounding him and the proxemic dimensions of the (very simple and straightforward) set, which is amplified by his own physical clumsiness, leading to him knocking props over and falling over backwards. This physical awkwardness perhaps most memorably presents itself in Jack’s self-conscious realisation: ‘It’s weird; what do I do with my arms? I never thought about that before.’ Here, the sequence acknowledges the fact that the (re-)production of natural, everyday behaviour can present noteworthy acting challenges; and Jack’s words strikingly echo those of Constantin Stanislavski who noted that: ‘in life you know how to walk, and sit, and talk, and watch, but in the theatre you lose the ability and ask yourself ‘Why are they looking at me? !’ (cited in White 2014: 299) Jack displays a concern for and simultaneously fails at realising a realist, invisible performance – one of his chosen solutions involves a stiff, unnatural gait without counterbalancing arm swing that reads clearly as performed (and badly performed); another sees him overcompensate and walk too smoothly (i.e. 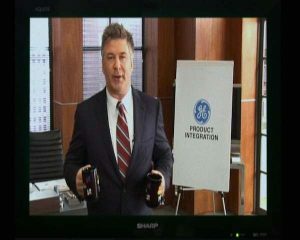 without natural bounce); and another (and his preferred) solution has him hold an NBC mug in each hand. Jack’s pro-filmic struggles with his own physicality are further developed in his belaboured carrying of the display board prop. It would be hard to imagine him carrying this in a more awkward way: he holds the prop in such a way that gravity and his own bodily momentum do not assist him (i.e. instead of holding it vertically, and either by the frame or the board, he holds it horizontally, and by the frame and the board); and he holds it in such a way that its weight overbalances (i.e. instead of holding it at the top or middle, he holds it at the bottom of the board), with himself wedged between the frame legs. 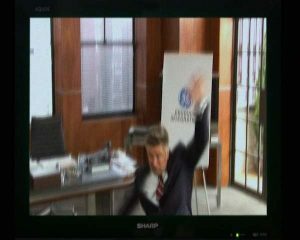 Baldwin’s carefully designed awkward physicality works clearly on the level of slapstick, which further marks Jack’s backward fall, when he – in a moment that may to some viewers intertextually recall David Jason’s famous fall in Only Fools and Horses (BBC1, 1981-2003) – misjudges the distance between himself and the desk on which he is trying to perch, falls lengthways and ends up prostrate on his back. Slapstick is also present when Jack turns over a page on the display board with too much force and accidentally knocks the board over, smashing it into a glass door. Very evidently, what is completely unavailable to Jack is any sense of a mind-body connection, in which his thoughts, emotions and physical actions are integrated and working complementarily. 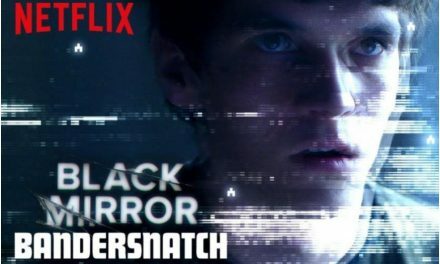 Jack’s attention and energy seem located (and indeed stuck) in his head, preoccupied as he is with worrying over his past and present struggles in front of the camera, trying to anticipate and decide what he should do next. 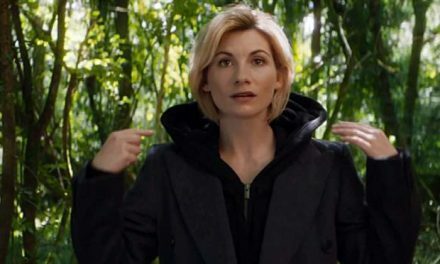 This preoccupation is what is partly to blame for his pronounced physical clumsiness, which the character had thus far not displayed within the programme – indeed, his very first appearance in the pilot saw him kick down a wooden board with much physical confidence. It also partly accounts for his tongue-tied stumbling over his lines, and for his failure to properly inhabit his body and the space around him. Facilitating his repeated loss of focus and concentration, this preoccupation consists of two closely related components that usually mean the kiss of death to a successful performance: self-consciousness and failure to be ‘in the moment’. What Stanislavsky wants, whether it is by exploring the method of physical actions or emotional memory is for the actor to experience. To be in a state of I am. By not preventing anticipation, Jack does not allow the moment to evolve, does not arrive at immediacy and does not experience. In Uta Hagen’s view, ‘bad acting always results.’ (2009: 102) In the ‘outtakes’ sequence, Jack is no exception, and is not, producing some mechanical and unengaged results. ‘Scenic truth’ (which is ‘actual fact’ distilled into a creative form). Trevor Rawlins (2012: 40) has noted that ‘make-believe truth’ is what might also be called bad or fake acting, and that ‘scenic truth’ may be termed as good acting, because the former lacks and the latter contains a leap of the imagination: the good actor experiences something as if it were for real. In the ‘outtakes’ sequence, Jack does not have that experience, thus his acting lacks truth, and may (if not must) be called bad acting. 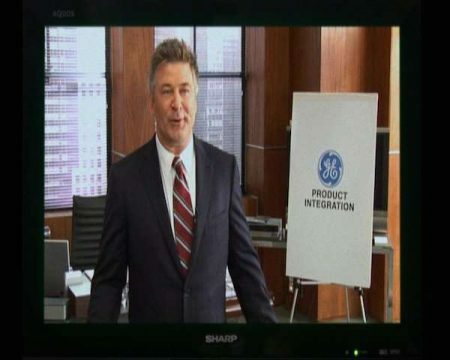 Interestingly, Baldwin has a strong back catalogue of acting bad performers, including a soap opera actor with a propensity for oddly pronouncing medical terms in a sketch from Saturday Night Live (NBC, 1975-present) – which intertextually links to Baldwin’s own soap opera acting past – and an unprofessional variety show host in 30 Rock live episode ‘Live From Studio 6H’ (6.19). As our discussion has demonstrated, Alec Baldwin manages to have Jack’s work in front of a camera fail remarkably comprehensively, running the gamut of bad acting and bad actor behaviour. What we have not yet unpicked is how Baldwin manages to perform bad acting through his own good acting. Therefore, much like the episode from which the ‘outtakes’ sequence stems, we will have to ‘super-size’ our writing and devote our next blog post to what Alec Baldwin does when he acts bad acting well. Gary Cassidy is currently undertaking AHRC-funded doctoral research at the University of Reading. His thesis explores the rehearsal process of playwright Anthony Neilson, using filmed footage of rehearsals and interviews. He trained as an actor at the Royal Scottish Academy of Music and Drama and has several years of professional acting experience – Equity name Cas Harkins – covering film, theatre, television and radio. Plans for future research focus on using his research methodology to explore the working processes of other contemporary theatre practitioners. Simone Knox is Lecturer in Film and Television at the University of Reading. Her research interests include the transnationalisation of film and television (including audio-visual translation), aesthetics and medium specificity (including convergence culture), and representations of the body. She sits on the board of editors for Critical Studies in Television and her publications include essays in Film Criticism, Journal of Popular Film and Television and New Review of Film and Television Studies. Benedetti, Jean. 2005. The art of the actor: the essential history of acting, from classical times to the present day. London: Methuen. Cardwell, Sarah. 2007. ‘Is Quality Television Any Good? : Generic Distinctions, Evaluations and the Troubling Matter of Critical Judgement’ In Quality TV: Contemporary American Television and Beyond, edited by Janet McCabe and Kim Akass, 19-34. London: I.B. Tauris. Carnicke, Sharon Marie. 1999. ‘Lee Strasberg’s Paradox of the Actor’ In Screen Acting, edited by Alan Lovell and Peter Krämer, 75-87. London; New York: Routledge. Carnicke, Sharon Marie. 2009. Stanislavsky in Focus: An Acting Master for the Twenty-first Century, second edition. London; New York: Routledge. 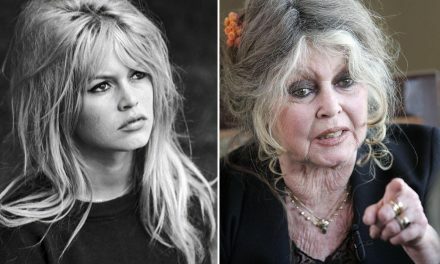 Hagen, Uta. 2009. Respect for Acting, second edition. Hoboken: John Wiley & Sons. Lury, Karen. 1995-1996. ‘Television Performance: Being, Acting and ‘Corpsing’’. New Formations 27: 114-127. Merlin, Bella. 2007. The Complete Stanislavsky Toolkit. London: Nick Hern. Mitter, Shomit. 2005. ‘Konstantin Stanislavsky (1863-1938)’. In Fifty Key Theatre Directors, edited by Shomit Mitter and Maria Shevtsova, 11-15. London; New York: Routledge. Pearson, Roberta. 2010. ‘The multiple determinants of television acting’. In Genre and performance: film and television, edited by Christine Cornea, 166-83. Manchester; New York: Manchester University Press. Rawlins, Trevor. 2012. Studying Acting: An investigation into contemporary approaches to professional actor training in the UK. Unpublished PhD thesis, University of Reading. Stanislavski, Konstantin. 2010. An Actor’s Work on a Role. Translated and edited by Jean Benedetti. London; New York: Routledge. White, R. Andrew. 2014. ‘Stanislavsky and Ramacharaka: The impact of yoga and the Occult Revival on the System’. In The Routledge Companion to Stanislavsky, edited by R. Andrew White, 287-304. London; New York: Routledge. Rebney and his further experiences are the subject of the documentary Winnebago Man (Ben Steinbauer, 2009). See Andrew Klevan (2005) for a useful example of in-depth engagement with achievement in film performance. Bad acting gets some (albeit limited) attention, by, for example, Karen Lury (1995-1996), Uta Hagen (2009) and Trevor Rawlins (2012). Sarah Cardwell (2007) is one example of this. See Roberta Pearson (2010) for a discussion of the significance of status in relationship to agency. A discussion of method acting, which is often reductively understood, is obviously beyond the scope of this blog post; see Sharon Marie Carnicke (1999). For a discussion of the Stanislavskian term ‘objective’, see our examination of Jennifer Aniston in Friends (NBC, 1994-2004).